The UK would be able to send 5,000 troops to Sudan to help ease the humanitarian crisis, the Army's most senior general has said. Chief of General Staff Sir Mike Jackson told the BBC's HARDtalk programme: "I suspect we could put a brigade together very quickly indeed." Tony Blair has said the crisis does not yet require British military intervention. 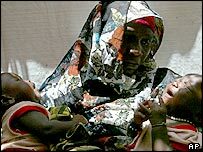 Pro-government Arab militias have forced more than one million black Africans from their homes in Darfur. Efforts are ongoing to agree a UN Security Council resolution urging the Sudanese government to curb the conflict, which the US Congress has labelled as "genocide". In an interview to be shown on HARDtalk on Friday and Monday, General Sir Mike said: "If need be we will be able to go to Sudan. I suspect we could put a brigade together very quickly indeed." He added that that would mean 5,000 troops. The government announced this week that 20,000 posts are to be axed across the Armed Forces. The Army is to lose four infantry battalions but General Sir Mike denied it would be left overstretched and unable to mount operations in places like Sudan. He told HARDtalk: "The Army is there to be used and it will have to go over its guidelines when the pressure is on." He accepted some equipment was in short supply in Iraq, due to "the speed at which things had to be done". Mr Blair told reporters on Thursday he had not ruled out sending the Army to the Sudan but the "critical thing" in the short-term was to try and make the current international strategy work. International Development Secretary Hilary Benn has defended the government's handling of the crisis and said the UK was the largest financial donor. He told the BBC Radio 4 Today programme the Sudan government was in denial about what was happening and the UK was leading international pressure on them. He said: "We have made it very clear to the government of Sudan that if they don't act to bring these attacks to an end, further consequences will indeed follow." Mr Benn added: "The UK has done as much, if not more, than any other nation in the world." But the Liberal Democrats want an EU-led force to intervene, under a UN mandate. Foreign affairs spokesman, Sir Menzies Campbell, has written to Foreign Secretary Jack Straw saying food aid and diplomatic pressure is not enough. He said: "With US and British forces stretched to breaking point, countries such as France and Germany have the opportunity to make a significant contribution. Tory international development spokesman John Bercow, who has just returned from the Sudan, said there was a "a lot to be said" for military intervention. But added that this should probably be undertaken through an EU or UN force. "On the humanitarian front, Hilary Benn has done a good job but there is a huge mismatch between our humanitarian policy and our foreign policy," he told BBC's Breakfast with Frost on Sunday. An Oxfam aid flight with 30 tonnes of water and sanitation equipment was due to leave on Friday night, but is set to be delayed until Sunday. The HARDtalk interview will be repeated on BBC News 24 on Monday 0430 BST.